Saturday 25th of April: “My son rang me at 9 o ‘clock in the morning to inform me that Nepal was hit by an earthquake. We knew Caroline, Umbrella Country Director & my daughter, was ok, but nobody could reach her husband Raj Kumar, leaving us terrified. That evening we got confirmation through Jack, Umbrella Communications Director, that they were together and ok, as were the whole Umbrella team. We went through the first days in complete shock and tears but we saw that help, support and money would be needed very soon. So, we just started to share on Facebook! The reactions were overwhelming and within two days the Stichting Paraplu Team (Umbrella Netherlands), myself and the whole family started fundraising, putting all the information we had on Facebook and asking all our friends to share with others. What happened was unbelievable – the money started pouring in! Caroline’s friends did a wonderful job raising money through their family, friends and colleagues, just as we had. There were family dinners, fundraising dinners and many other events! The Stichting Paraplu has done a wonderful job getting their sponsors involved and spreading the word! After the first week we did not recognize many of the people donating so we had succeeded and the word was out – complete strangers and even companies were donating! This showed us that they had so much loyalty and trust in Umbrella that it brought tears to our eyes – and it is still does! Dutch people really like the idea of knowing where their money is going to and by keeping them updated about all the work Umbrella is doing in Nepal, they continue to be so generous. 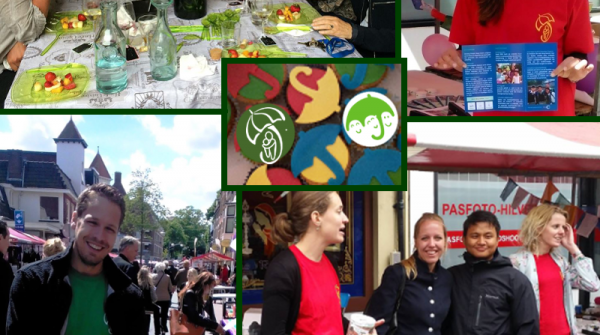 A little collage of some of the events going on in The Netherlands! 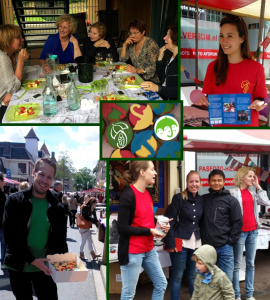 Through my son Robert, we got a free stand at the braderie in Hilversum for two days which brought us even more money, with the added bonus that Stichting Paraplu and The Umbrella Foundation are a little more known now in Holland. Everything in the stand was donated to us by sponsors (leaflets, posters, candles, ingredients for the cupcakes). The restaurant Stan & Co in Utrecht, managed by Caroline’s dear friend Stijn, raised money which they called ‘water action’. They charged a symbolic 1 euro per bottle of water and almost 1000 euro’s was raised during the first month – all of which goes to Umbrella!! The Dutch fundraising has raised an unbelievable €50,000, through all of these efforts! It is overwhelming to have experienced this support for Umbrella! We will continue to fundraise because if the people in Nepal and in Umbrella can go on, we certainly can too…. To get in touch with the Stichting Paraplu team in Holland, click here… or go to their website.